Sunday March 28 1909 I went to church and over home to dinner. George [Bremer?] who is spending the day with Fannie was there awhile. I stopped at Fannies a moment she is sick in bed. I went over to Eugene Harts and came home at 4.30 I spent the evening in reading and writing. Mr Whitaker fell and broke his hip today so Hattie told me tonight. he had started to go to election to vote. Monday March 29 1909 It was a cold day. Will hauled hogs for one of the neighbors. I did not do much house-work today. I read some and worked on fancy work. Did churning along. Lee would have been 47 years old today had he lived. 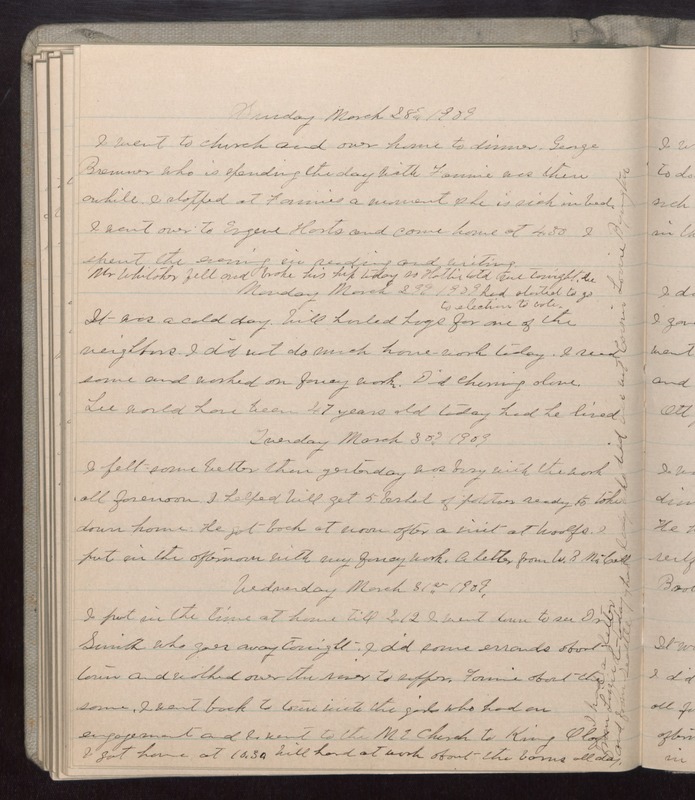 Tuesday March 30 1909 I felt some better than yesterday was busy with the work all forenoon. I helped Will get 5 bushel of potatoes ready to take down home. He got back at noon after a visit at Woolfs. I put in the afternoon with my fancy work. A letter from W.B. McCall Wednesday March 31st 1909 I put in the time at home till 2.12 I went down to see Dr Smith who goes away tonight. I did some errands about town and walked over the river to supper. Fannie about the same. I went back to town with the girls who had an engagement and I went to the M E Church to King Olaf I got home at 10.30. Will had to work about the barns all day. I had a letter from Lizzie L- today and [illegible] lady who died [illegible] [not?] Corine Louise Byington from Seattle.